THE Government is fully prepared to deal with any form of crime including violent protests and protect law abiding citizens who are keen to go about their normal day-to-day business. 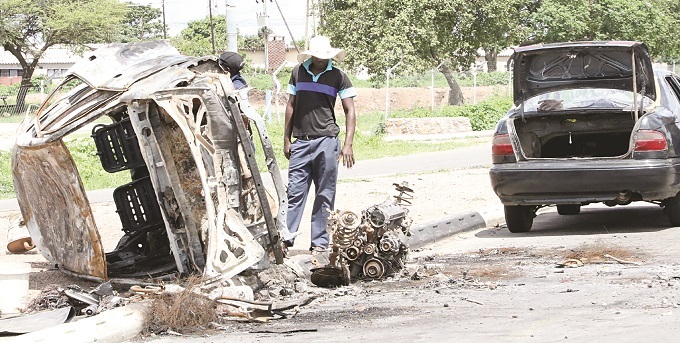 The warning comes amid reports that the MDC-Alliance and some Non-Governmental Organisations were urging citizens to repeat protests this week in similar fashion to those that rocked the country last week resulting in wanton destruction of property. The country’s security services have also sternly warned organisers of last week’s violent demonstrations against urging their allies to continue with the destructive plans this week, and has assured members of the public of adequate security. “The security services want to reiterate the assurance by Government that adequate security has been put in place to ensure members of the public and business go about their activities without hindrance. The Zimbabwe Defence Forces and security services remain committed to the provision of safety and security to all members of the public. In the same vein, we want to warn those bent on causing mayhem that the law will be applied without fear or favour,” said Colonel Mugwisi. “Some of these uniforms worn by criminals were seized by rogue elements during the recent riots in Epworth and Chegutu. A case in point is a recent arrest of five armed robbers in Epworth, Harare, on 14 January, who were using police and military regalia to commit armed robberies after hiring vehicles from car-rental companies. We are giving an ultimatum to individuals who have retired, deserted, and absented themselves without official leave (AWOL) from services to immediately handover uniforms either to the police or the Zimbabwe Defence Forces. All those who do not comply with this directive will be flushed out by already deployed members of the security services,” she said. Last week’s unrest was reportedly hatched at a meeting held on January 11 in Belvedere, Harare, under the ambit of the Zimbabwe Civil Society Convergence (ZCSC). In essence, the meeting was meant to coalesce opposition pressure groups such as Tajamuka, Occupy Africa Unity Square, this Flag, ZCTU, General Consensus, Citizen Manifesto and Concerned Citizens Agenda under the umbrella of the Crisis in Zimbabwe Coalition (CiZC). Initially, the stay-away – regarded as a euphemism for the violent protests – was meant to coincide with the dates teachers wanted to hold their demonstrations. Sources privy to goings on in the civic society grouping, which has also been inciting civil servants to down tools, said it has since activated its second phase by launching a petition to AU chair Rwandan President Paul Kagame to intervene to stop the purported human rights abuses against “citizens”. In the petition, CiZC chairperson Richard Mahiya urged the AU to intervene in the same way they did in DRC after the recent elections, when it advised the elections management body in that country not to announce the final results. It is believed that the security agents’ timeous intervention to blunt the riots foiled the designs of the NGOs, who were buoyed by a $2 million injection by two Western governments. MDC-Alliance president Mr Nelson Chamisa – who is easy bedfellows with the NGOs who are doing his bidding – has even been intimating that the MDC-Alliance has the capacity to take up arms. During a press conference in the capital on August 3 last year, Chamisa said: “We do not believe in violence even if we have the capacity to resort to arms.” His threats to make the country ungovernable were a running thread throughout his election campaign rallies before the July 30 harmonised elections. In an interview Information, Media and Broadcasting Services Minister, Senator Monica Mutsvangwa, said any more forms of violence was an open application to the State to deal with the perpetrators decisively. She said regime change agents will not succeed. “We would want to assure people that Government will protect them from hooligans. Our security forces are on the ground monitoring the situation and ensuring that the security of the people is guaranteed. We want to protect our law abiding citizens. As you have witnessed in the past few days we have arrested a lot of protesters. This shows that we are committed to ensuring the security of our citizens. Our security institutions are on the ground and will provide security,” said Minister Mutsvangwa. The protests, orchestrated by MDC-Alliance and civic organisations are also aimed at tainting President Mnangagwa’s engagement and reengagement tour of Europe. In addition, the opposition and its allies is plotting illegal regime change. President Mnangagwa has also condemned violence and urged people to remain calm. Last week, protesters suspected to be MDC-Alliance hooligans unleashed terror on residents in most cities and towns across the country barricading roads, terrorising motorists, destroying properties and looting goods mostly food from supermarkets. In an interview yesterday, Zanu-PF Secretary for Legal Affairs Cde Munyaradzai Paul Mangwana said the party has discovered that the protests were of a political nature hence the party was preparing a political response. “What happened last week was clearly a political agenda and therefore as a party we think there must also be a political response, we will defend this country in all ways possible. People died during the liberation struggle and this cannot be tolerated,” he said. It is estimated that the economy has suffered contagion economic effects across all the sectors with direct losses estimated to be $800 million. The retail sector alone suffered the most as an estimated $500 million worth of stock and properties were vandalised. Zimbabwean industries contribute $100 million daily to gross domestic product, and the terror attacks cost the country around $300 million directly. Hundreds of protestors and looters including senior MDC-Alliance officials such as MPs have since been arrested on allegations of inciting violence. In Bulawayo alone, 309 were arrested, 110 were arrested in Mashonaland West, and many others across the country. Police and other security agencies have stepped up efforts to arrest those that were involved in looting businesses. Meanwhile, Government will from tomorrow avail buses that will charge $1 per trip between various residential suburbs and the Central Business District in Harare as it steps in to offer relief to commuters. The move, which also targets other towns and cities, is part of a broader plan to review the urban mass transport system. The Zimbabwe United Passenger Company (ZUPCO) will coordinate the new transport system after it was urgently tasked to manage a fleet of buses that will cover all suburbs in Harare, and will also extend to other towns and cities. Briefing journalists in Harare yesterday, Information Minister Mutsvangwa said the new system will enable passengers use various forms of payment including cash and plastic money. Speaking at the same press conference, Transport and Infrastructure Development deputy Minister Fortune Chasi said authorities had made interventions to ensure that there were enough buses to meet demand.